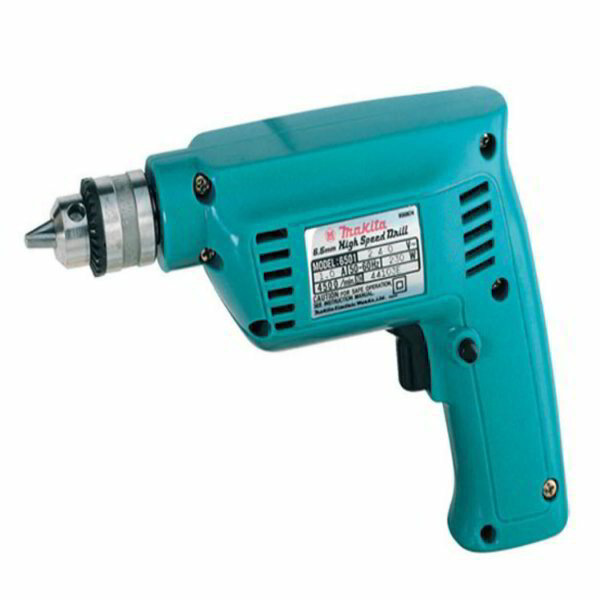 Makita 6501 High Speed Rotary Drill 1/4"
Makita 6501 High Speed Rotary Drill 1/4" is a double insulated, compact, and lightweight high speed drill. It comes with 4,500 rpm high speed rotation, making it ideal for fast drilling for small holes. With its compact pistol grip design and 0.9 kg weight, drilling and handling makes easier and less stressful. This drill is suitable for drilling small holes in thin sheet materials. Makita 6501 High Speed Rotary Drill 1/4" features depth gauge for uniform hole depth, powerful 2.1 AMP motor for continuous operation, high impact and corrosion resistant housing for long tool life, all ball and needle bearing construction, and adjustable depth guide for drilling to a predetermined depth.